My virgin IPL treatment took place a few years ago and like most virgin experiences, it was far from pleasant. The laser painfully snapped against every inch of my face like super strong and forceful rubber bands. Since I was wearing goggles and couldn't see, the anticipation of where the laser would next hit intensified the pain. When the laser was positioned over the chin and mouth area, I could feel it penetrating through my teeth, leaving a tingly and uneasy sensation. Suffice to say, I didn't go back after that experience. Flash forward to last Saturday. I had been noticing some small sunspots developing on my cheeks and knew that the best way to nip it in the bud was via IPL. As much as I disliked my first experience, I knew it had to be done. I wasn't about to let ten minutes of temporary pain get in the way of ridding ever-darkening sun spots. And surprisingly, the second time around was much better. I didn't experience any discomfort or pain. The laser felt like a hot flash of heat and light and nothing more. I'm guessing they improved the technology since the last time I had it. 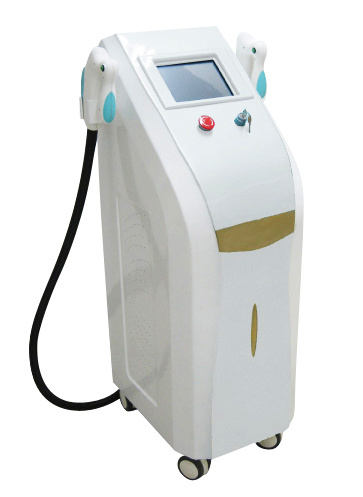 IPL stands for Intense Pulsed Light and is used to rejuvinate and clear the skin of brown and red spots, acne and refine skin texture. The use of IPL treatments over a period of time (usually 3-5 treatments) should help heal scars, fade discoloration, smooth fine lines, and generally give skin a more translucent appearance. Although I haven't noticed any changes in skin texture, I'm happy to report the sun spots on my cheeks are fastidiously fading. NICE! I'm a legal secretary and I have heard of cases involving burns from this treatment; makes me nervous to go get laser hair removal! Its good to know you had better results the second time around. Phew.